Heat oven to 400°F. Spray 13x9-inch (3-quart) glass baking dish with cooking spray. Brush both sides of chicken with oil. Sprinkle both sides with remaining ingredients. Place in baking dish. Bake 25 to 35 minutes or until juice of chicken is clear when center of thickest part is cut (at least 165°F). This recipe is tailor-made for make-ahead meals. Roast up a batch, cool, and shred or chop the chicken. Divide it up into well-wrapped portions for the fridge or freezer. Pull it out for salads, tacos, casseroles or quick soups. Recipe makes 4 cups of chopped cooked chicken. Take this recipe up a notch by ramping up the seasonings. Since you’ve got 2 lb of chicken, you can use different blends of herbs and spices on them, depending on how you might like to use them. Watch the doneness on the chicken; cook it just until juice of chicken is clear when center of thickest part is cut and temperature is 165°F. Cut into the thickest part of the largest breast to check at 25 minutes. Check the smallest pieces, and remove them from the pan if they’re done before the largest piece. Cook or freeze poultry within two days of the sell-by date. If the poultry is uncooked, whole or in pieces, you can store it in a refrigerator (36° to 40°F) for 1 to 2 days, or in the freezer (0°F or colder) for 12 months (whole chicken) or 9 months (chicken pieces). With just six pantry-staple ingredients and 10 minutes of prep, this oven-baked chicken breast recipe couldn’t be easier—or more delicious. 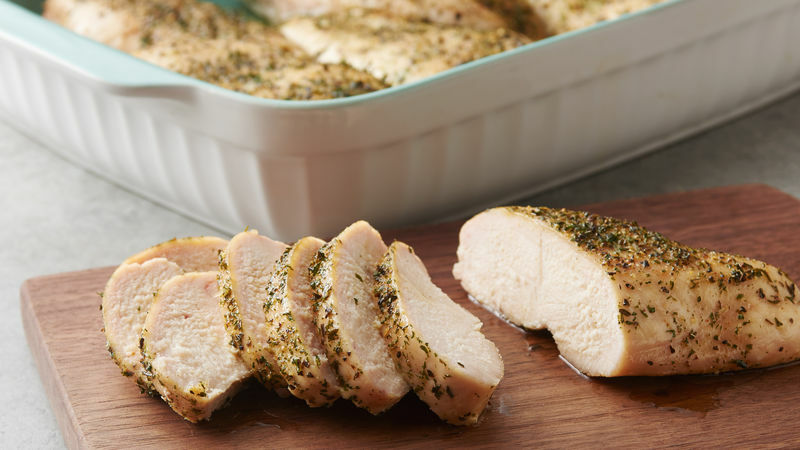 Olive oil and herbs from your pantry are all that's needed for tasty oven-baked chicken breasts that can be on your dinner table in less than an hour. And in the half-hour it takes to bake the chicken breasts to finish, you can pull together a side dish or vegetable dish that makes a complete meal. If you’re lucky enough to have leftovers, you can use them to pack chicken salad or chicken sandwich lunches for the next day. If this roasted chicken recipe has you looking for even more no-fail dinner options, explore Betty’s many delicious chicken recipes.